Family & Relationships: Peadar Ó Conghaile (husband, deceased), Sarah Uí Fhlatharta (mother), Séamaí Ó Conghaile (son, deceased), Liam Ó Conghaile (son, deceased), Berni Ní Neachtain (Liam’s former partner), Evan Ó Conghaile (grandson), Vanessa Breathnach (daughter in law), Fia Ní Chonghaile (granddaughter), Liam Óg Ó Conghaile (great grandson). Máire is the surrogate granny for everybody in Ros na Rún and she’s a real granny to some of them with the brood she has had. She is a fountain of knowledge of what’s going on in everybody else’s life. It was always easy for her to pick up on the local news back when she used to run the shop and post office with her husband, Peadar. Since then, having worked in the medical centre and having ran a B&B at home all the while, there isn’t a secret in the locality that she hasn’t heard. Being as inquisitive as she is, she often finds herself giving people advice, even if they don’t want to hear it. She is good-natured and kind and she is very proud of her family. She likes going to mass and her faith is a great comfort to her in times of need. Her son, Liam, died tragically in a fire in Season 9. Liam was her golden boy and his death grieved her deeply. 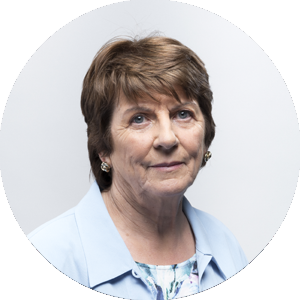 The love of her loyal husband, Peadar, has helped her overcome life’s hardships. In Season 21 Peadar died suddenly, leaving Máire heart-broken. Berni is always nearby to support her and she enjoys a good relationship with Peadar’s daughter, Laoise. She is very maternal and dotes on her grandchildren Evan and Fia. You could say that she over-indulges Fia sometimes and gives her too much freedom. Máire is often the one left holding the baby when Fia wants to escape from home for a little while. Perhaps she does get stuck babysitting Fia’s little son too often, but then again she’d do anything for her family.